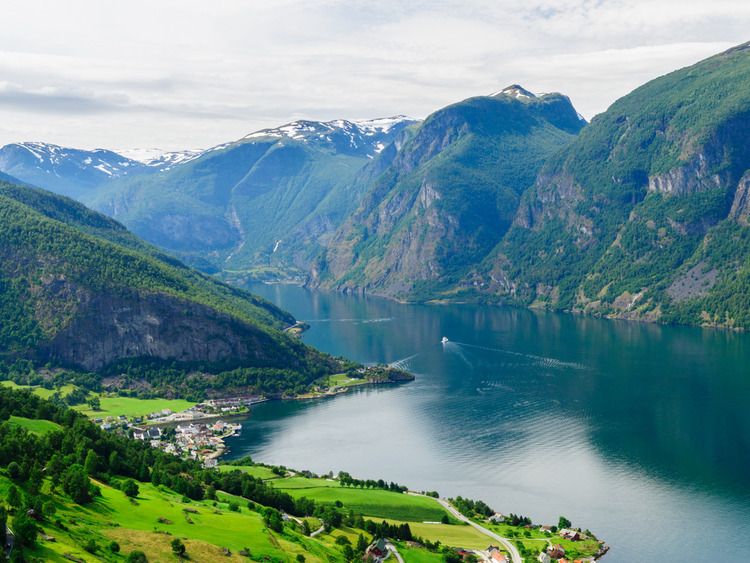 A scenic tour along winding roads as far as a spectacular viewpoint and a stroll in the picturesque village of Aurland - an excursion to appreciate the artistic and natural beauty of the fjords from a new angle. * We leave the port by coach on a **sightseeing tour along the Aurlandsfjord**, a narrow stretch of sea flanked by green slopes with countless waterfalls emerging from the glaciers above. * We pass the village of Aurland and continue our climb as far as the **Stegastein viewpoint** perched above the fjord. The viewpoint was built in 2006 as part of a project to promote national tourist trails and is made up of a **ramp jutting out 30 metres from the mountainside** so visitors can feel truly surrounded by the panorama of the fjord. * Made entirely of laminated wood, the structure is perfectly integrated with the surrounding environment and offers **breathtaking views** of the fjord and of the Aurland village 650 metres below. * We get back on our coach and descend as far as the **charming village of Aurland**. Here, we enjoy some free time to stroll around the houses, take a few pictures and admire the small Medieval stone church. * We recommend that you book early because only a limited number of places are available.